My head is clear, I perfectly remember ATI's Ocean screensaver... A light breeze sways water making it roll languishingly over the sand and removes geometrical boundaries between the sea and the coast. Nothing of this is implemented into games (that still offer glyceric or rubber water). How wonderful is to lie on the wet sand cooled after the day heat with legs in warm waves, and watch the sky with so many stars on it... 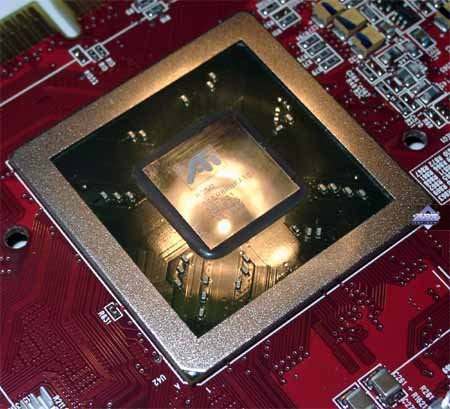 Even if NVIDIA and ATI CEOs would buy all programmers on Earth, no vertex shader will ever reproduce this remoteness, finite infinity, inconceivable distance to stars. Alexander shouts again... It's something about taking Taylor... To hell with this math! He's finally gone, thanks God. What a beautiful couple... Oh! It's Philipp Gerasimov with his new rendered girl!.. My, she's pretty!.. Hey, who said I was watching, I wasn't! 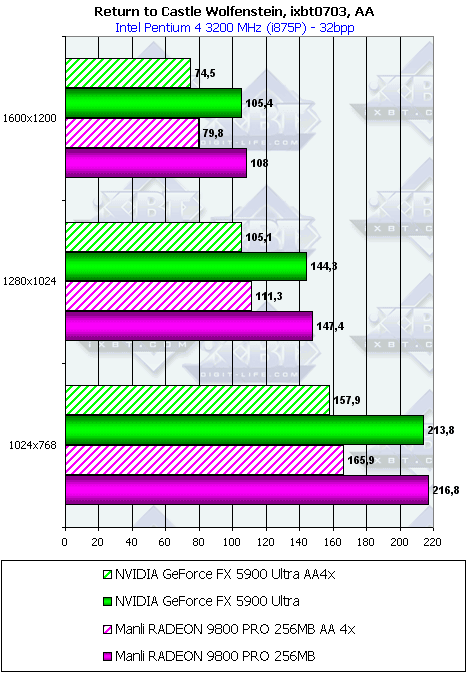 The third article from the bottom describes the most expensive video card of the RADEON 9800 PRO family. 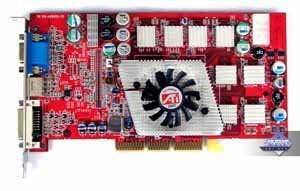 Such product comes equipped with 256 MB DDRII memory which is a bit more efficient than that of a usual RADEON 9800 PRO. Sure, such add-on doesn't cost $100 (the price difference between the cards) but it must be very curious to look at the fight of titans, i.e. 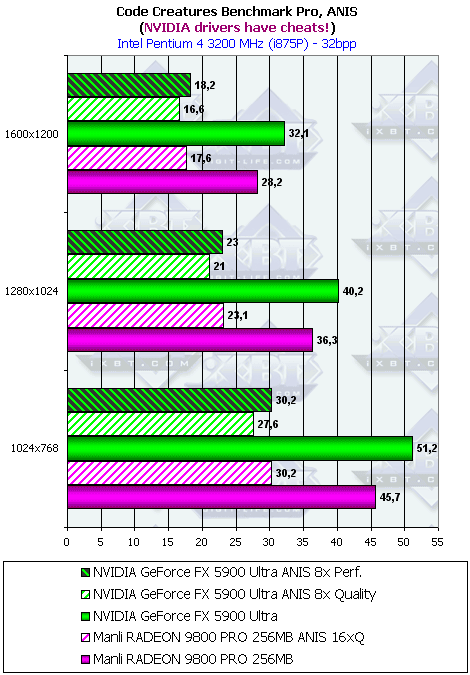 the fastest accelerators from ATI and NVIDIA (GeForce FX 5900 Ultra 256 MB). 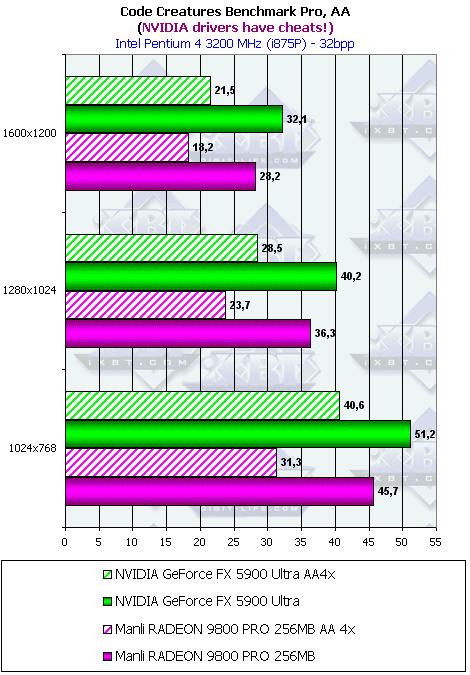 We compared them before but that was with the old demo benchmarks. Today we have the new ones, that is why the battle looks intriguing. Besides, both products are of the same price range (for the middle of July on our local market). The card developer, Manli, is not a new-comer. Many have certainly heard about it. 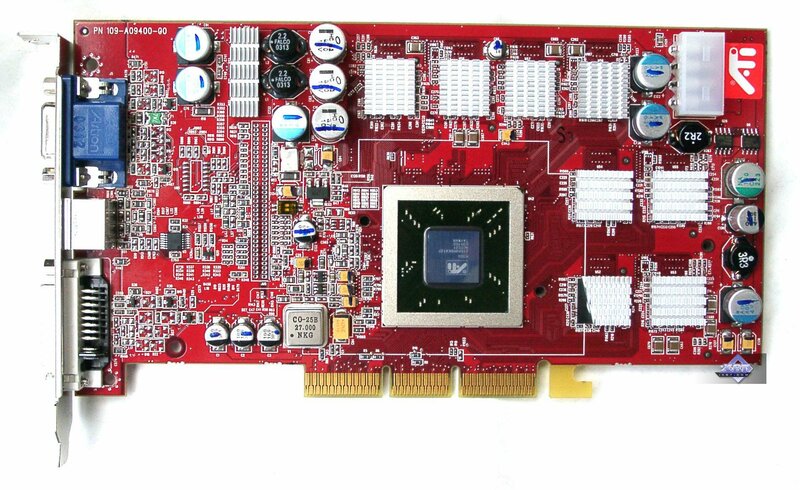 However, quality of its old low-end cards based on the RivaTNT/TNT2/GeForce2 MX was pretty poor. Fortunately, the situation's changing for better. First of all, the company has shifted to ATI; secondly, it has improved the quality control system, and the number of products under its own trade mark is increasing. 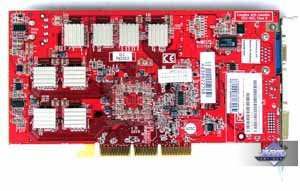 In the High-End sphere Manli often places orders with third card makers, in particular, PC Partner. The firm is headquartered in Hong Kong, but also has production facilities in China. It makes a lot of products by orders, i.e. without its own trade mark. 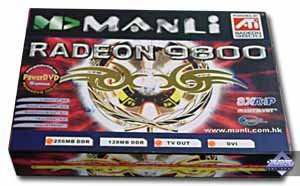 But today we have a video card which Manli is greatly proud of. 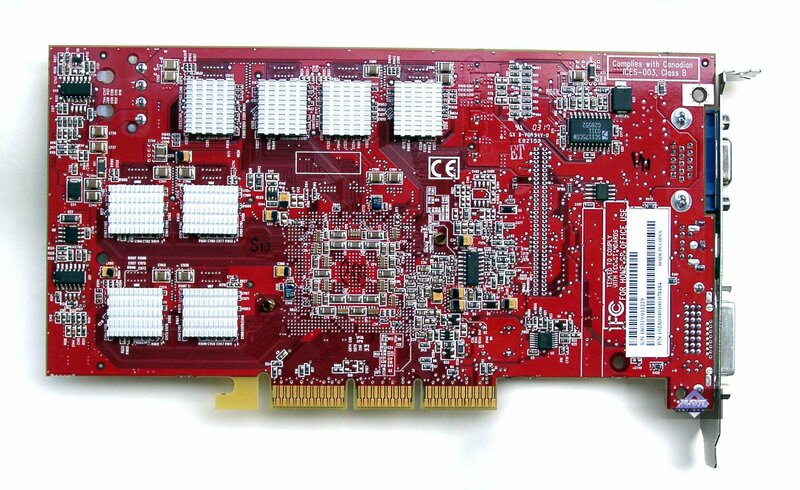 AGP x8/x4/x2 interface, 256 MB DDR-II SDRAM memory in 16 chips on both PCB sides. 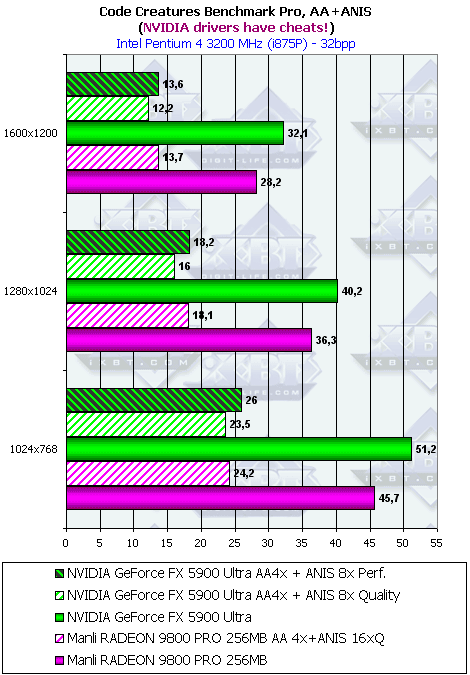 Samsung memory chips of 2.2ns access time, it corresponds to 454 (908) MHz, but the memory works at 350 (700) MHz, the GPU at 380 MHz. 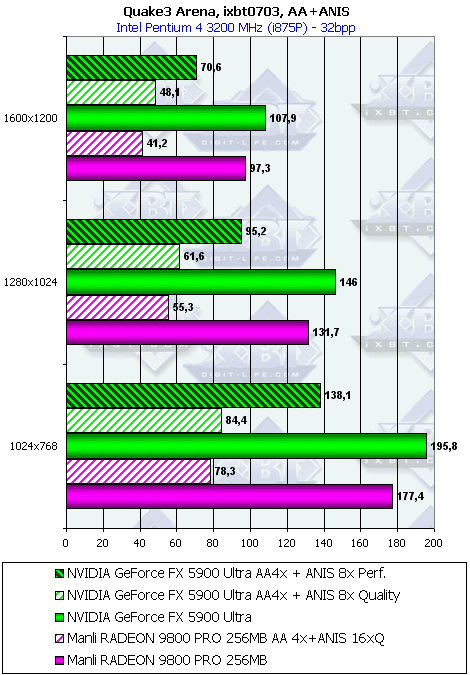 256bit memory bus. 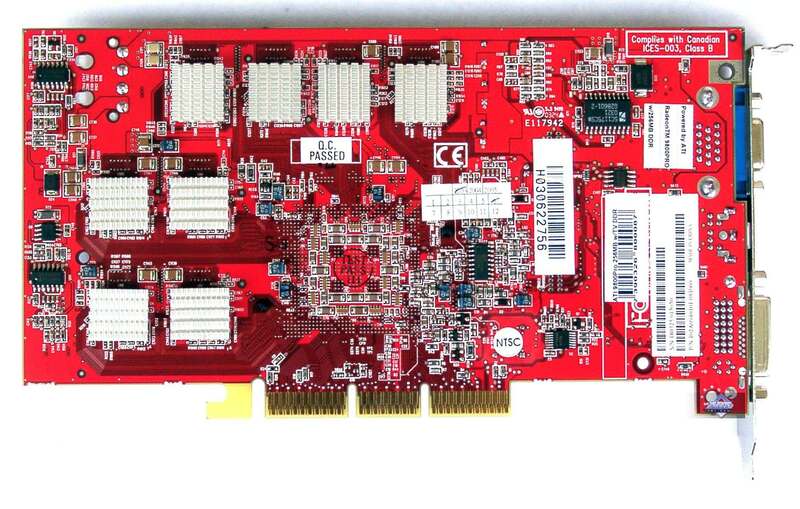 This is the very reference card as the p/n indicates that the product was made for ATI. It's very difficult to make such a sophisticated card (the layout and tweaking requires time and expertise), that is why cards from different firms will remain copies for quite a long time yet. 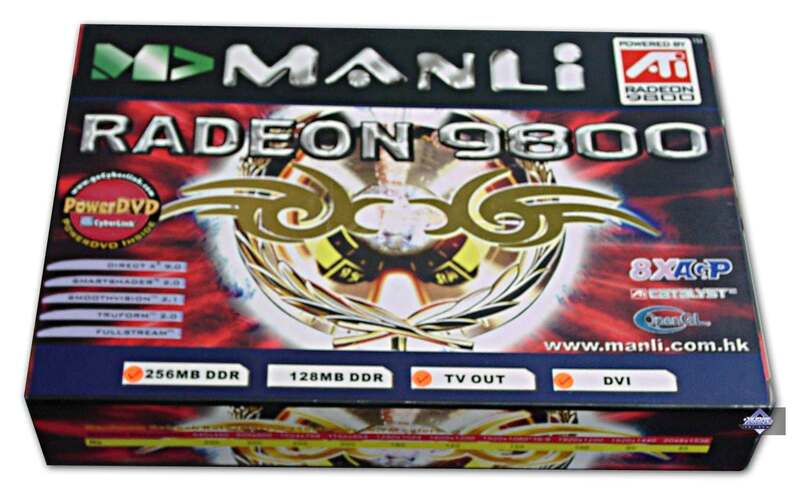 Actually, I can't see what Manli has brought in this card. Even the cooler is reference. The cooler looks very unsophisticated. 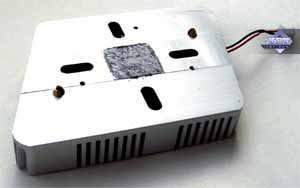 The sink has a protruding part to be pressed tighter to the chip and to make sure that the protection frame around the die which can turn out to be higher doesn't hamper heat exchange. The processor codenamed R350 is hidden under the sink. 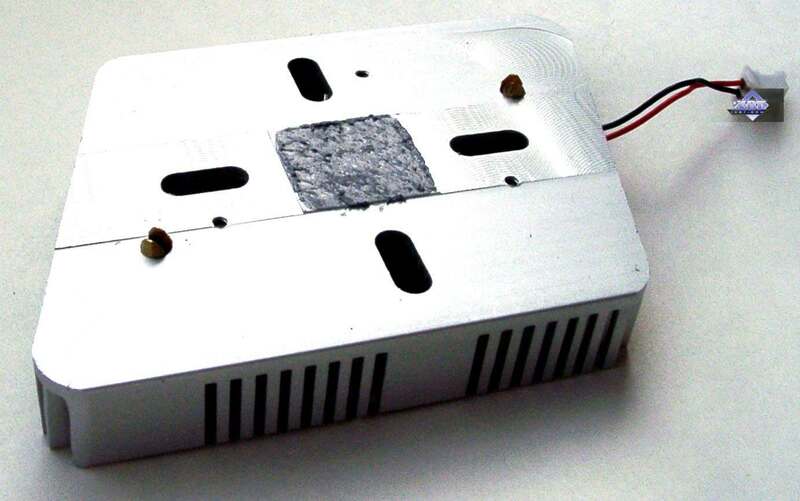 The first photo demonstrates that it has a mirror-like surface. 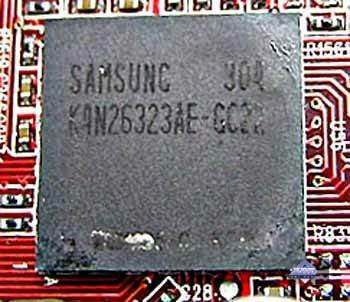 Each memory chip is equipped with its own sink, though it works at 350MHz instead of the rated clock of 450 MHz. But even in this case the temperatures are high. 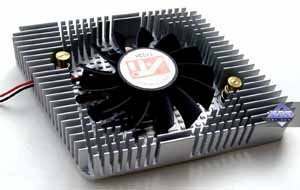 Well, such memory needs another more expensive PCB and a cooler like FlowFX so that it can work at 450 MHz. 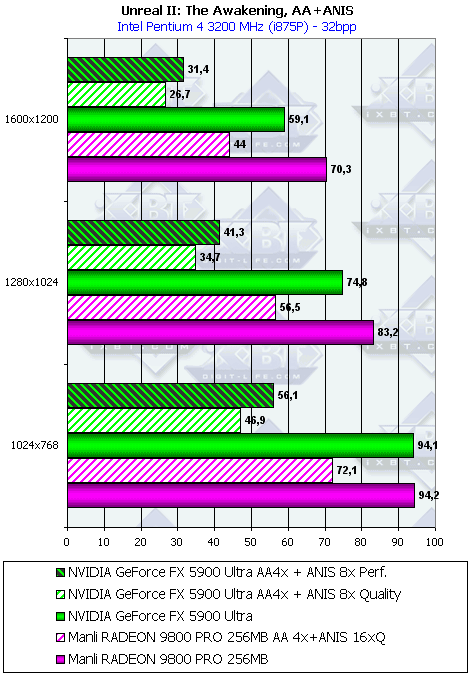 This proves once again that it was released in haste and needs further improving. NVIDIA arranged the memory chips around the processor to make the distance from the core as small as possible. Here the chips are arranged differently, and it's a problem to reach the farthest chips. 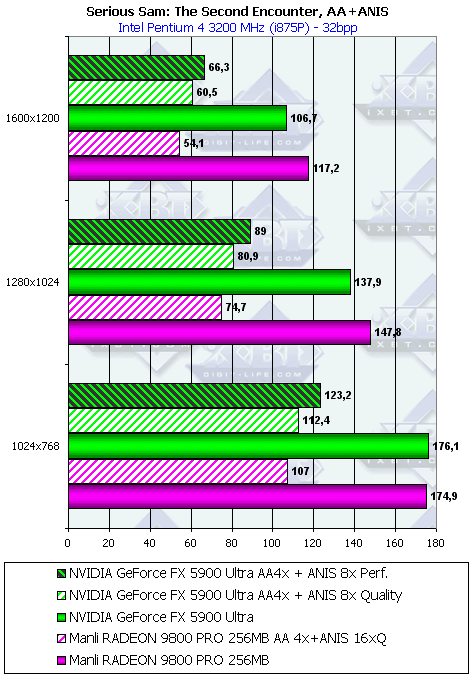 Such layout doesn't promise high scores, even equal to the GeForce FX 5900. 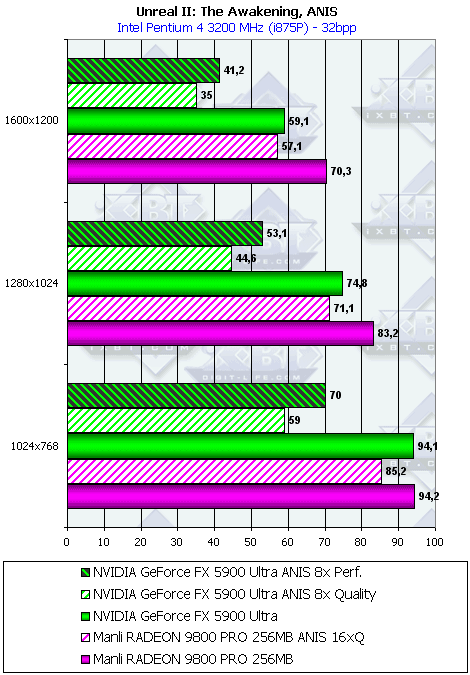 But there are some other aspects beside the clock speeds that influence the performance. 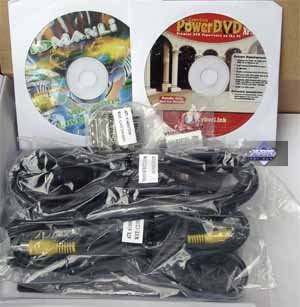 User Guide, CD with drivers and utilities, PowerDVD, TV extenders, DVI-to-d-Sub and S-Video-to-RCA adapters. The package isn't a match for a High-End product at all! It's small and hardly houses the whole pack of accessories! 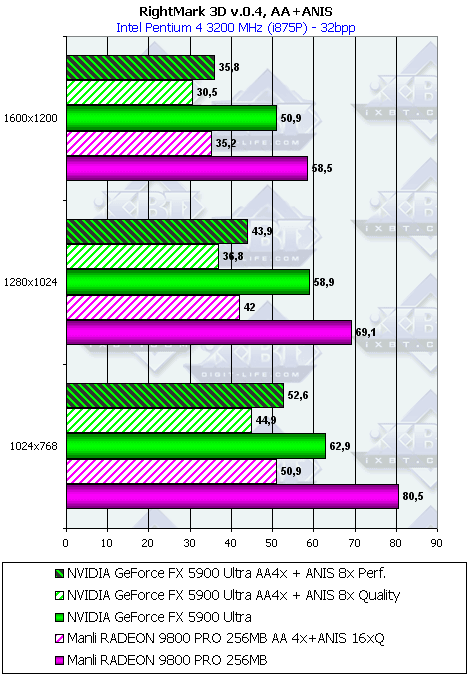 Besides, these marks on the box of the memory size, TV-out support... make the box look like that of a GeForce MX or even cheaper noname card. 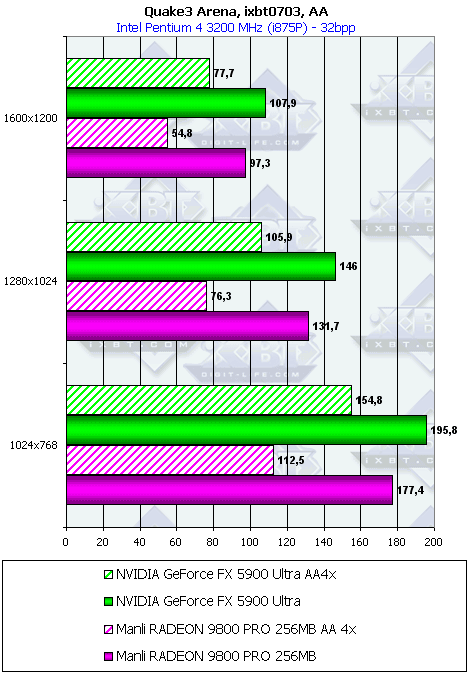 NVIDIA's partners - MSI, Albatron, ASUS, Gainward etc. - show a good example of what a card should look like... Users that pay some $500 for a card must be unconditionally pleased with such product! Isn't it so difficult to make a good package, add some pleasant bonuses like pens, trinkets, calendars, caps, shirts etc., and equip the card with its own cooler?! 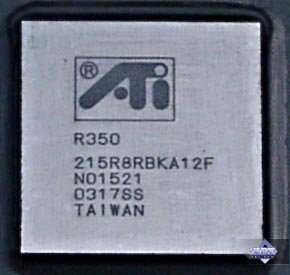 Almost all ATI's partners ignore packages. Where is ATI's marketing? Isn't it interested in making the product more attractive? 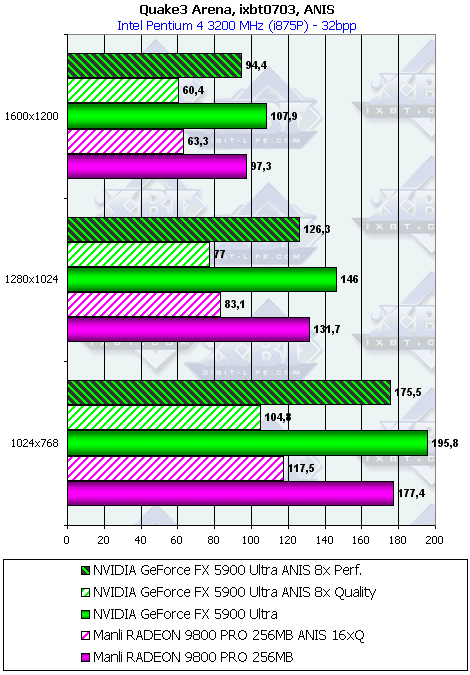 The cost is incomparable to the video card price. 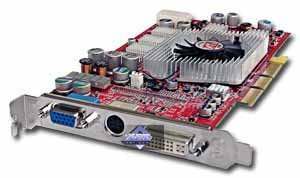 Have you ever seen that a High-End video equipment sell in OEM packages? Or in wretched boxes? 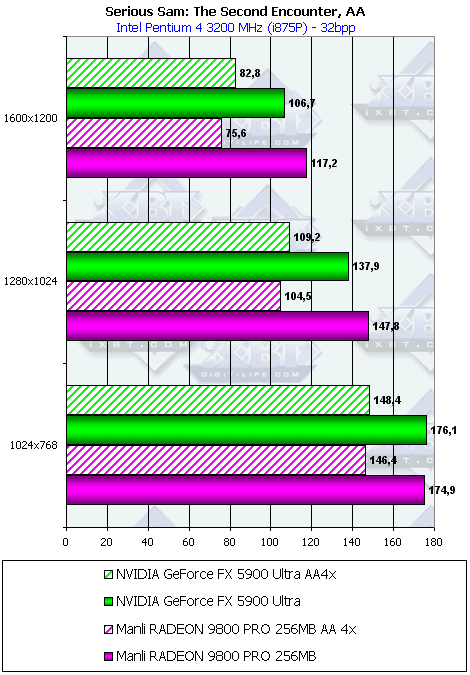 Reference card NVIDIA GeForce FX 5900 Ultra (450/425 (850) MHz, 256 MB, driver 44.71). 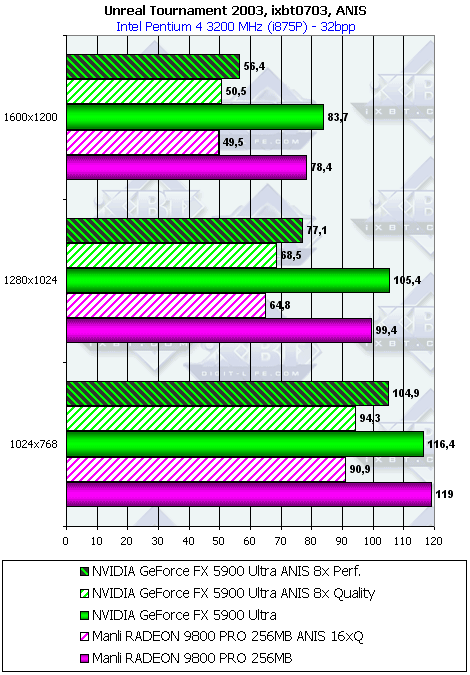 ATI wins only at the highest-quality level of anisotropy but remember that the GeForce FX 5900 demonstrates better quality of this function. The scores are generally equal here. 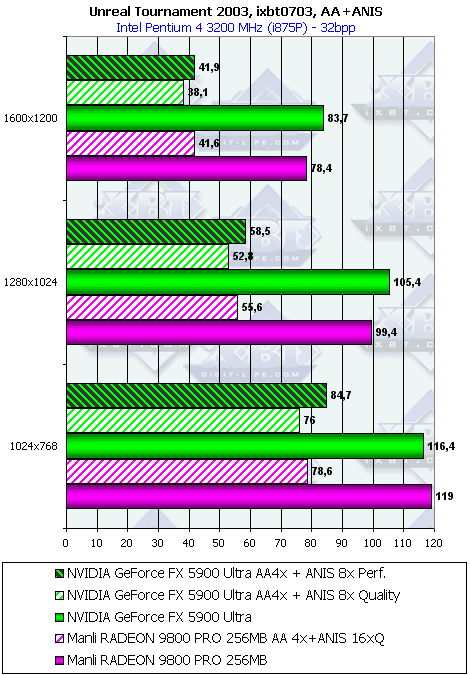 When the AA or anisotropy are disabled Manli marginally wins, but with the AA and Quality-level anisotropy the card gets more scores, though NVIDIA's Performance anisotropy smashes it to pieces. 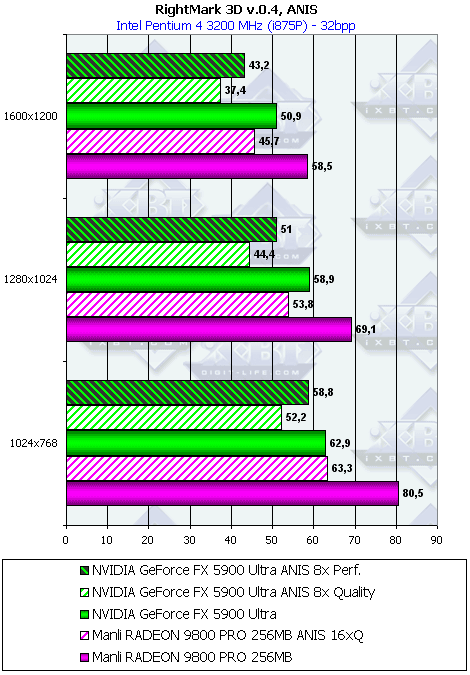 Note that NVIDIA's drivers play tricks in this test. 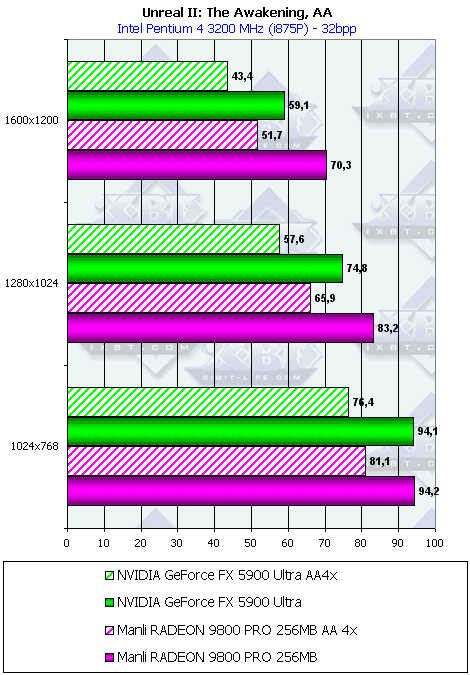 The performance drop was revealed only of the FX 5900 on v44.90, - its performance is now equal to what we got earlier with the Anti-Detect. 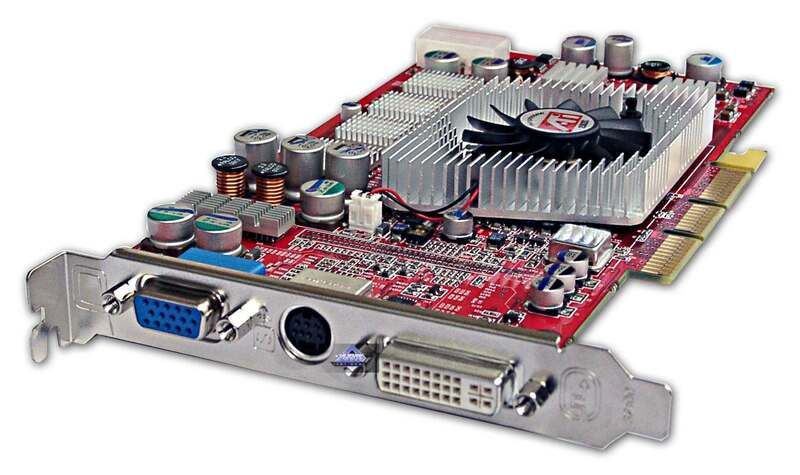 At the moment it loses to the NVIDIA's card. But the comparison is not correct because of the cheats; as soon as possible we will try to run this test on v44.71 with AD to make the comparison objective. 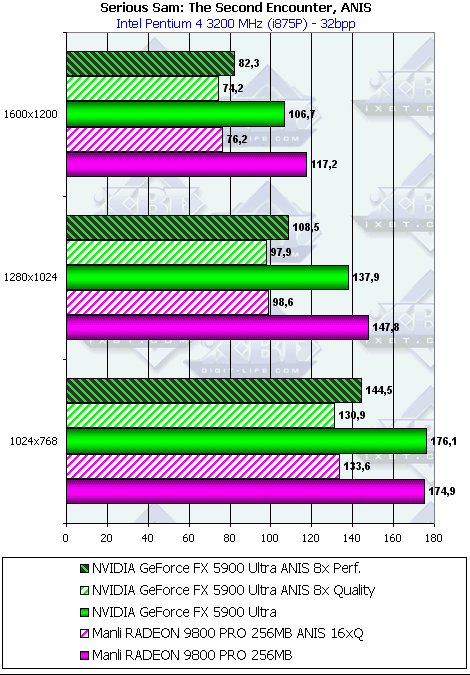 Or we will use next versions of NVIDIA drivers if no cheats will be used here. 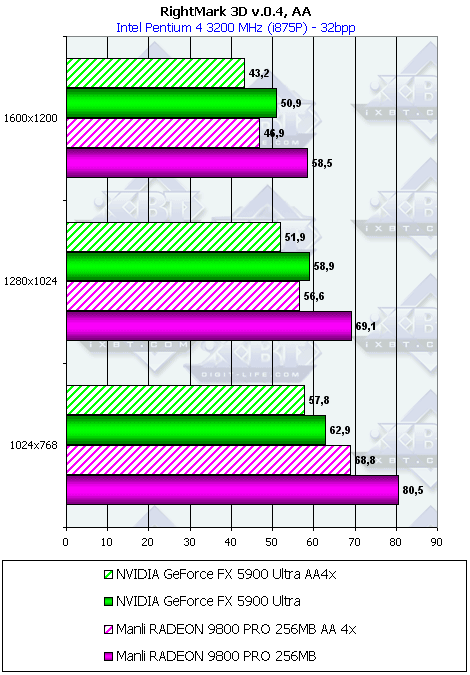 The RADEON 9800 PRO take a lead, though the anisotropy presses it off the throne. I can say that the scores are generally equal. This test reveals who copes better with shaders. 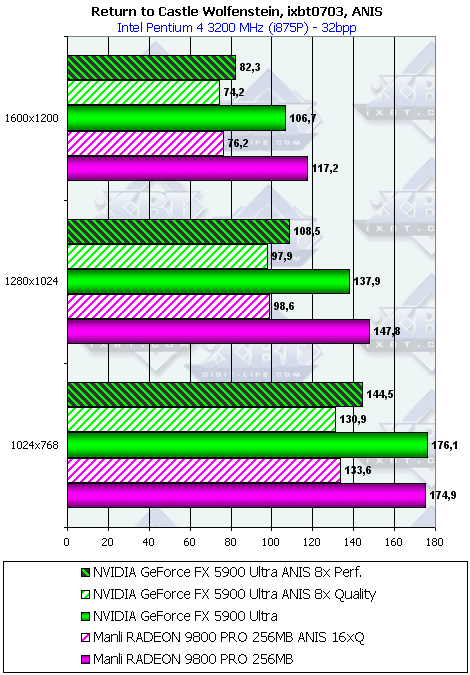 Undoubtedly, the FX 5900 falls behind. ...The sunset is nearing, I'm walking along the coast again. A tortuous line on the wet sand changes its shape all the time: none of the designers managed to realize such an effect yet. The Sun plunging into the sea leaves us milky water that flabbily shimmers under the dim light, a crimson sky and amazement that games are still far from it. I looked at the beach, at the sunlit road with lush gardens along it.. How many polygons would it take to reproduce such beauty?... A kangaroo's jumping nearby. On his pouch I noticed the word "Sapphire". He stopped, waved me, cast a look into his pouch and said that the sample was growing up... When he ran away it occurred to me that I hadn't test the Sapphire yet and... woke up again. 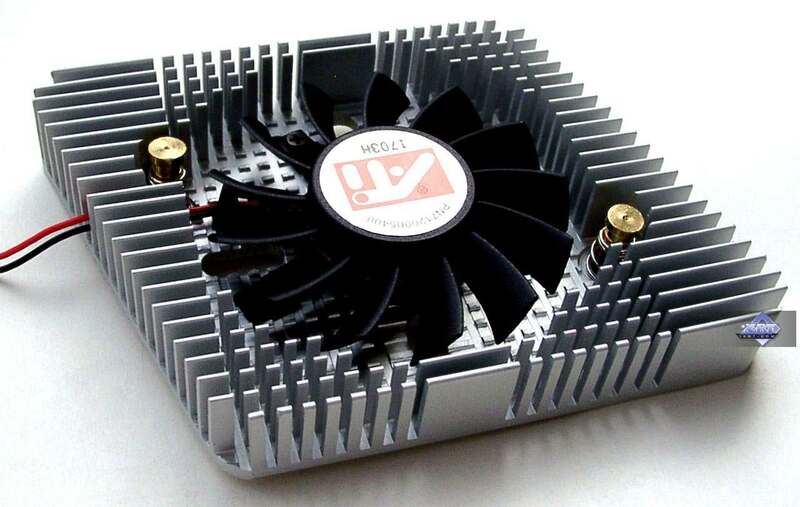 The card's not bulky and has a simple and quiet cooling system. I must say it again that High-End products from ATI's partners ship in very poor boxes. 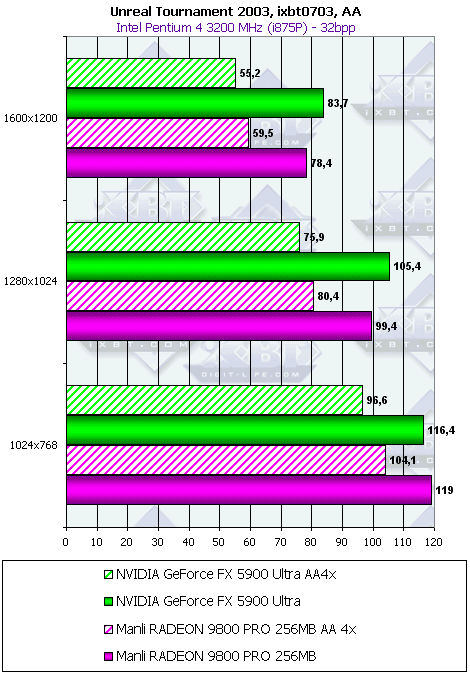 Also, I'd like to thank ATI for the excellent chipset RADEON 9800 PRO that doesn't yield to its rival in speed and functions (all these shader versions 2.0+ can be of interest only for developers). 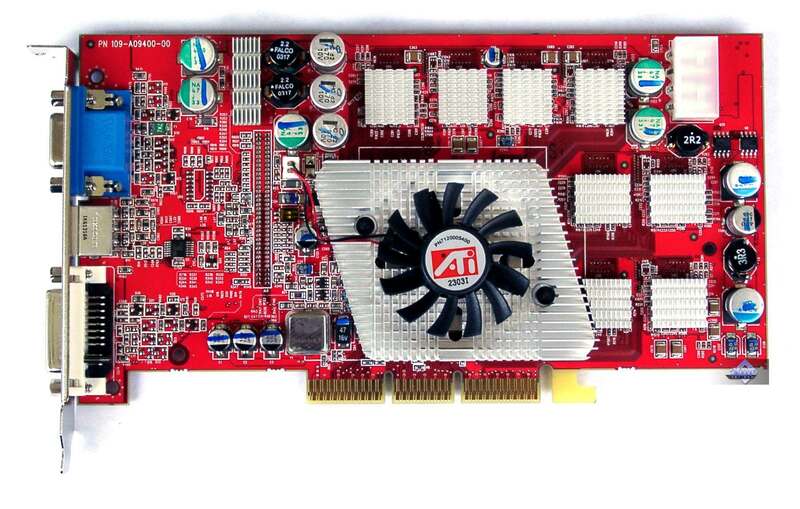 But the card is obviously overpriced considering that extra 128 MB and DDR II which run into $100 are not needed yet. 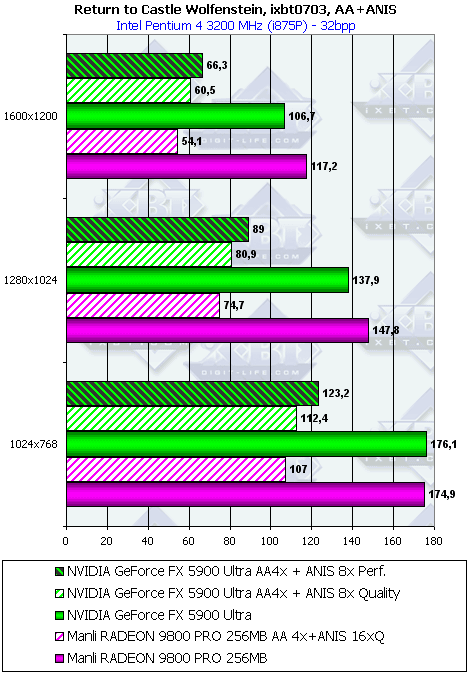 I hope ATI and its partners will soon solve this problem so that these poor packages could become more attractive compared to a bit slower but fully-armed FX 5900 Ultra based cards.